1-2ppm (if secondary sanitation system is fitted and ORP remains above 720mV). Whilst we appreciate that chemical levels fluctuate in a swimming pool based on several variables, we expect that a documented action plan, prior approved by healthy swim, be implemented by the operator of the swimming pool facility upon the occasion where these chemical levels differ from the above criteria. Free chlorine– The available chlorine dissolved in the pool to guard swimmers against bacteria and viruses. Measured in parts per million (ppm). 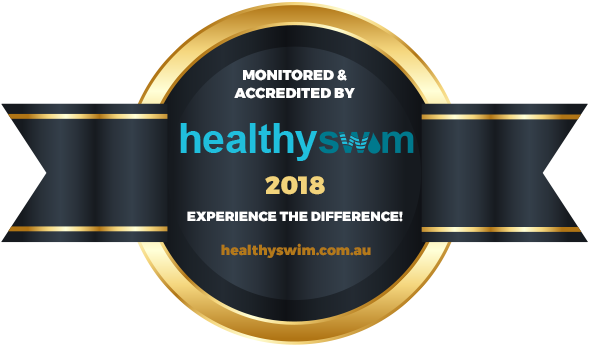 If levels are too low (without a secondary sanitation system installed such as UV, Ozone or AOP) swimmers are left susceptible to bacteria and virus infections. If chlorine is too high, swimmers can experience burning of the eyes and skin. Chlorine sensitivity is also an important issue for eczema and asthma sufferers. Total chlorine– The sum of free chlorine and combined chlorine (waste products) in the pool. Measured in ppm. Combined chlorine (nasties)– Mathematical calculation (total chlorine – free chlorine) to identify the level of waste products (organic and inorganic) that have combined with the free chlorine in the pool. Measured in ppm. These nasties not only feed bacteria but alone cause irritation to eyes, skin, ears, throat and lungs. ORP- (Oxidation/Reduction Potential)The measure, in millivolts (mV), of the ability of a chemical substance to oxidise or reduce another chemical substance. The higher the ORP reading, the more effective the kill rate will be of bacteria and viruses in the water. pH- The measure of the acidity of the water. A scale from 1 to 14, where 7 is neutral. The human eye produces tears of 7.2 in the morning and 7.4 later in the day. Correct pH is critical as it determines how reactive free chlorine is at guarding swimmers from bacteria and viruses. A pH too high will cause chlorine to react slowly and allow the possibility of bacterial or virus infection. If pH is too low, chlorine is extremely reactive but the strong acidity can burn and irritate the eyes and skin of swimmers. Total Alkalinity– A measure of how much alkaline substance is in the water. In a pool we are concerned with the carbonate alkalinity. Also known as a buffer substance to stabilise the pH level, so inturn free chlorine can sanitise the water effectively. Measured in ppm. Total hardness– The measure of the sum of calcium and magnesium in the water to determine how hard or soft the water is. If the levels are too low the water is corrosive and this can result in irritated skin, eyes and ears of swimmers. If levels are too high then the water can become cloudy and provide poor visability for swimming. Cyanuric acid- (sunscreen for free chlorine)- A chemical added to the water to protect the free chlorine in the water from UV degradation of the sun. This product is only used in outdoor pools. If levels are too low it wont effectively protect the free chlorine degradation by the suns UV rays. If levels are too high the free chlorine can become ‘smothered’ and decrease its reactivity and optimal ability to guard swimmers against bacteria and virus infection. Phosphates– The measure of phosphate dissolved in the water. Measured in parts per billion (ppb). The main source of phosphates found in pools are from the swimmers skin. Phosphates along with nitrates are a food source for algae (early identifiable by its initial life stage of slimy coatings on the pool surfaces).